Innovations don’t stop with the DSX telephones. Right out of the box, the system has a built-in Automated Attendant which can answer incoming calls, play a greeting, and allow callers to dial extensions and departments directly without operator assistance or additional equipment. Also built-in is the ability to record a custom message for callers on hold.DSX is sized right – from the economical DSX-40 to the DSX-80/DSX-160. To maintain the value of your investment, all DSX-80 cards can be migrated to the DSX-160. Even when growing from the DSX-40, your investment in IntraMail, programming,telephones, and other station equipment is retained. NEC designed the DSX with affordability and scalability in mind.Since DSX is simple to install and easy to use, the expenses of configuration, programming, and post-installation training are minimized. Over a decade of intense feature development ensures that the core DSX call processing features are mature, efficient, and reliable – yet intuitive and easy to use. Install DSX IP keysets on-premise in a managed network or off-site in a remote office.Choose between two types of DSX IP extensions: the 34-Button Backlit Display and the 34-Button Backlit Super Display.These feature-rich IP keysets offer the same features as their digital counterparts, have Full Duplex speakerphones, and are quick to set up in an IP environment. Compliant third-party SIP phones, soft phones, and Analog Telephone Adapters(ATAs) are also supported. 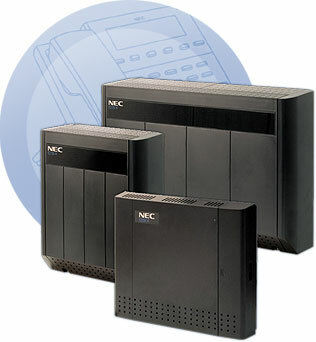 The ability to add voice mail is built into the system and only requires a compact flash card to activate. IntraMail is a full-featured Voice Mail Auto Attendant system that will greet and transfer incoming callers and record voice mail messages. With built-in voice prompt guidance in English, Spanish, and French, IntraMail is a great fit in multilingual environments. From 2 to 8 voice mail ports are available and easily upgraded through licensing. Message Center– Notify groups of extensions of important messages with visual indication using a message center key. Directory Dialing– Dial a name instead of a number to reach your party. Message Notification– You can receive a call - anywhere - when a new message arrives. Conversation Record– Save and record your conversation with the touch of a button. Live Call Screening– Listen as callers are leaving you a message and pick up only the calls you want to answer. Park and Page– Allows a caller to page you without operator assistance. You can pick up the call from any extension. Email Integration– Receive notification of a new voice mail message to your inbox. The notification includes the caller’s number and name and can optionally include the recorded message as a .WAV file attachment. Cascading Message Notification– Cascading Message Notification can call you at up to five preset destinations to let you know a new voice mail message has arrived. Find Me Follow Me– Helps an Automated Attendant caller find you when you are not at your desk. Upgrade License– Simple license upgrade from IntraMail to IntraMail Pro. The capability for Caller ID (with Call Waiting)is inherent in every DSX system. With Caller ID, you can identify incoming callers before the call is answered. The caller’s name and number (if available) will appear simultaneously in the display. Logging– Stores the name, number and time/date of outside calls. This allows for easy review, save and redial of received calls. Return Call– Easily return a call without manually re-entering the caller’s number. Select from a list of choices or have the system automatically redial the call for you. To Analog Ports– Caller ID information can be sent to analog single line ports for use with customer-provided Caller ID accessories. An office supervisor can quickly customize basic system features from their PC with the Windows TM-based Office Administrator. This includes the Time and Date options, important extension feature and voice mail options, and Speed Dial numbers. These features can also be programmed from an office administrator’s phone. Backlit Display and Illuminated Dial Pad*– for easy viewing in low light areas. Interactive Soft Keys– that change function as you use your phone, allowing you to access to advanced features by just pressing a key. User Level Programming– easy and intuitive guided menu system for customizing the features of your telephone. Hot Dial Pad– that lets you dial a call without first lifting the handset or pressing keys. Dual color (red/green)LEDs– to help you easily distinguish between your calls and those of co-workers. Desk Stand– adjustable for two different positions. Wall Mounting– built-in for low-profile wall mounting capability. * Capacities listed are system maximums and may be limited by system configuration. **** Connectivity limited by available VoIP Gateway ports.